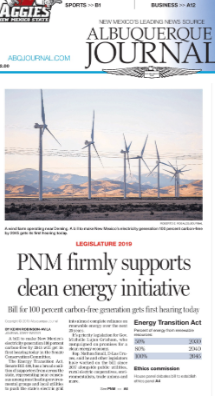 A recent headline in the Albuquerque Journal noted that “PNM supports the Legislature’s clean energy initiative.” Of course we all love when corporations step up and support a clean environment and all kinds of socially-beneficial policies. But what is not mentioned is that PNM’s rates and profits are essentially set by regulatory fiat. They are a monopoly and if electricity generation costs go up (as they likely will under this plan) then PNM can raise its rates (and potentially make even more money) than if prices were cheaper. So, it is hardly a surprise that PNM would support this bill. None of this information is conveyed in the headline or the text of the article. Nor is the issue of nuclear energy and how THAT form of zero-carbon electricity is being ignored as a source of “clean” energy in this legislation. And then there is another article about the road situation in the oil patch in Southeast NM. The Journal headline reads “Oil and gas boom wreaks havoc on southeast NM highways.” Unfortunately, no mention is made of who manages those highways. Of course the State of New Mexico does and, with a SURPLUS in excess of $1 billion thanks to the oil industry in that part of the State, the FIRST spending priority should be to use a portion of that money to improve the roads that so much of our State’s income relies on. But, it is a lot easier to just blame the booming oil & gas industry rather than blaming the people in Santa Fe (including but not limited to the Legislature) who do such a poor job of directing resources to the roads which need them. Of course the whole thing could be solved if they just got rid of a certain train from Albuquerque to Santa Fe. We don’t expect perfection, but having news stories and headlines accurately reflect reality would be nice. Your comments are so right on every point, Paul. Thanks. Time to move to AZ or TX.